Hambantota town is often considered the heart of the “Deep South” of Sri Lanka. Located nearly 170 km south of Colombo, Hambantota is the main town of the district by the same name, in the Southern Province. It’s a coastal town which has seen rapid development in recent years and promoted as a second commercial hub of the country after Colombo. The history of Hambantota can be traced back many centuries when Sri Lanka was a lucrative stop over for trade routes. Sailors and traders from as far away as China, Siam (present-day Thailand) and Indonesia traveled here on “sampans” (boats) and “sampan-thota” soon became Hambantota. It was an important location in the Southern Kingdom of Ruhuna, which was established by King Mahanaga around 200 BC. It was primarily an agricultural area, and an extensive network of irrigation canals, fed by rainwater-collecting reservoirs, were built by ancient Kings to support the growing of rice and other crops in the dry climate of Hambantota. Hambantota and its environs became well-known in ancient Lanka as a place that guarded the culture of the Sinhala people as well as serving as custodians of Buddhism. Even today, Hambantota is a stopover for tours of pilgrims who travel to the shrine at Kataragama or the Tissamaharama Raja Maha Viharaya which was built in the 2nd Century BC by King Kavantissa. The city was an important administrative hub during Colonial times, and architecture from the Dutch and British periods are scattered throughout the district, with better examples seen as you travel into the interior where old “walawwas” or ancestral homes dating from this era are still lived in. Life and times in this area during colonial times are brought to life in the novel “The Village in the Jungle” by Leonard Woolf, husband of writer Virginia Woolf, who served for three years as the Assistant Government Agent in Hambantota in the early 20th century. Today, Hambantota is a bustling town that has a newly built international port, the Magampura Mahinda Rajapakse Sea Port as well as the country’s newest international airport, the Mattala Rajapaksa International Airport, located around 43 km away. The country’s first ever dry-zone botanical gardens is also being developed here, in a 300-acre site located in Mirijjawila and when completed will be the country’s largest botanical garden. The Mahinda Rajapaksa International Stadium was a venue for the 2011 Cricket world cup. Hambantota is the host city for the 2017 Asian Youth Games. This is the first Multi-sport event hosted by Sri Lanka to be staged outside of Colombo. The Hambantota area has long been known in Sri Lanka as the best source of salt in the land. And the acres of salt pans can be easily seen on a tour of the coastal areas of Hambantota, a shimmering white expanse where workers scrape the salt as the sea water dries in the hot sun. The salt pans have also become favorite places for many varieties of birds and a walk along the salt pans will make an interesting stop on your journey through the area. 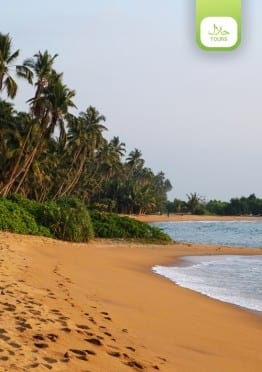 With sweeping sandy beaches on either side, it is also a convenient base for exploring the nearby Bundala National Park and, somewhat further away, the Ruhuna National Park and the Yala National Park.